Janesville, WI -- Carol A. 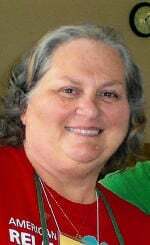 Brown, 68, of Janesville, WI, passed away peacefully and dignified on Saturday, April 13, 2019 in Janesville, WI. She was born on July 1, 1950 in Elmhurst, IL, the daughter of Walter and Anne (Kopecky) Celusta. Carol was a graduate of Hinsdale High School, Hinsdale, IL. She married Robert Brown on May 17, 2015. Carol was employed by the American Cancer Society as an accountant. She was a very outgoing and giving person, a devoted grandmother who cherished family traditions and always put her loved ones first. Carol enjoyed crafting, traveling, dancing, church picnics, polka music, fishing and watching sunsets on the Wisconsin River. Survivors include her husband, Robert Brown of Janesville; children, Jennifer (Anthony) Wyels of Beloit, WI and Josh (Amanda) Martin of Janesville, WI; grandchildren, Lilianna and Philip Wyels, both of Beloit; brothers, Alan Celusta of Door County, WI, and Robert Celusta of Nashville, TN. She was predeceased by her parents and daughter, Tracy Bryant.